Alice's Adventures in Wonderland is a children's novel. The title is usually shortened to Alice in Wonderland. Charles Lutwidge Dodgson wrote the book. He wrote it using the pen name Lewis Carroll. John Tenniel drew the 42 pictures in the book. The book was published by Macmillan Publishers in London. It was released on 26 November 1865. It has been adapted to numerous movies. The story starts with Alice sitting with her sister beside a lake. Suddenly, a white rabbit runs by. Alice runs after him. She finds his rabbit hole. She falls through the hole. She meets many characters underground and has some amazing adventures. She grows larger or smaller by eating different things like cakes and mushrooms. At the end, she enters a lovely garden. The Knave of Hearts is charged with stealing some tarts. A trial is held. Alice thinks the trial is ridiculous. She says so. Everyone is offended. There is a great commotion. Alice suddenly wakes up. She is back where she started, sitting with her sister beside the lake. The story was told on a summer outing to three little girls. One of them was named Alice Liddell. Alice asked Dodgson to write the story down. Dodgson accepted the task. It took two years. The story was first called Alice's Adventures Under Ground. When Dodgson prepared the Alice story for publication, he added more events, such as the Mad Hatters's Tea Party, new characters, such as the Cheshire Cat, and changed the title to Alice's Adventures in Wonderland. 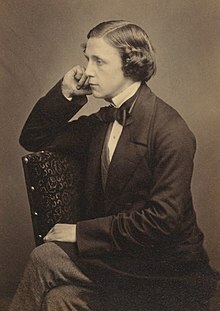 The story was so popular that Dodgson, (under the pen name Lewis Carroll), wrote a sequel called Through the Looking-Glass. The Alice stories, often known as Alice in Wonderland, are popular in music, movies and plays. Tim Burton's 2010 movie version, Alice in Wonderland, starring Johnny Depp, Mia Wasikowska, Anne Hathaway, and Helena Bonham Carter. This page was last changed on 28 October 2018, at 06:28.